So, today at work I had a little bit of idle time to find out the exact effects of Microsoft’s encryption technology “Bitlocker”. Having my computer encrypted gives me a safer feeling about walking around with sensitive data, not to mention the fact that some companies require to be compliant when it comes to security measurements. 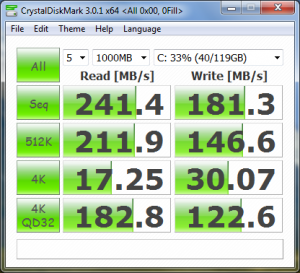 To see what the effects were on encrypting my SSD I did a test run of CrystalDiskMark before and after. Note that the differences between an encrypted disk and a unencrypted disk is not that large. Which is a proof to me it is safe to walk around with an encrypted disk. 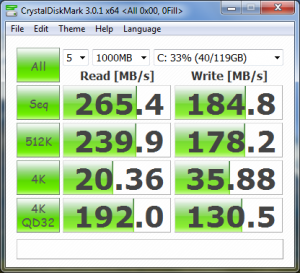 The test was run on a HP Probook 6560b with an Core i5-2410M and 8 Gigabytes of memory.